Miss New Jersey will be around for another year, after a successful appeal. The state pageant was among several whose license were revoked or not renewed, after some had voiced dissatisfaction with the new Miss America leadership. But Miss New Jersey’s new executive director, David Holtzman, said he doesn’t want to focus on the negative. Instead, he said he wants to increase the Miss New Jersey Pageant presence throughout the state. “It’s been too much in South Jersey,” he said of not only the pageant itself but many of the events surrounding it. “A couple of meetings seemed to be the south against the north,” Holtzman said. As a result, they will be seeking out new board members from throughout the state. This does not guarantee that the Miss America Pageant will remain in Atlantic City. The organization is reported to be shopping around for a new venue. But Holtzman said he is hopeful the pageant will remain in its birthplace, after a few years in Las Vegas. The pageant’s trip west didn’t do much for the brand or the ratings. “No one in Vegas really knew about it,” Holtzman said. But he’s optimistic it won’t leave again. Bruce Deifik has offered his Ocean Resort, which Holtzman said he believes would be a good venue. 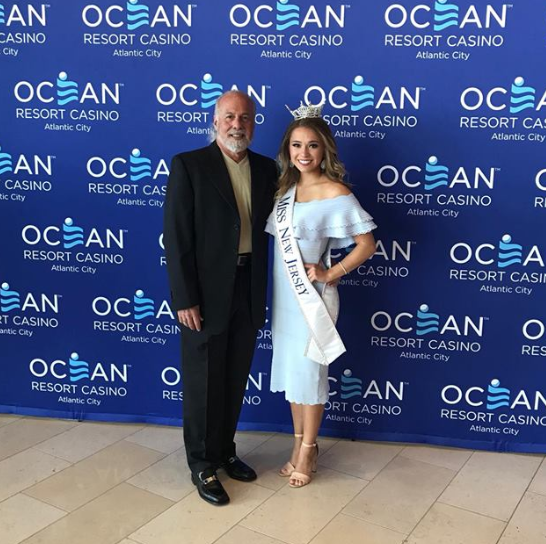 A photo on the Miss New Jersey Education Foundation Facebook page shows him and current Miss New Jersey, Jaime Gialloreto, at the opening ceremonies for the casino. Holtzman first got involved with the pageant the year Cara McCollum wound up winning the crown in 2013. McCollum died in 2016, from injuries sustained in a car crash. She was 24.